Does your company already have a sustainability or CSR strategy yet you’re struggling to embed it into the business model, governance and operational areas? Are your employees engaged in the company’s aspirational goals, practicing sustainable behaviours? Strandberg Consulting has the experience and expertise to quickly diagnose and break down barriers to improve capacity and buy-in. The sustainability strategy and policy direction have been set: Now what? Implementing and embedding sustainability into the business and corporate culture is hard work. There are no proven formulas for integrating sustainability into governance and day-to-day operational decisions. Coro has made it her life’s work to govern, lead, invent and improve implementation strategies for boards, executives and CSR and sustainability leaders. She has developed tools, roadmaps and guidance for organizations embedding social and environmental – non-financial – factors in business. She has coached many CSR managers on tactics for high potential CSR integration. She has two decades of experience as a corporate director and 15 years’ experience advising companies on sustainability implementation she can put to work for you. For guidance embedding sustainability into governance and functional mandates and business plans, put Coro’s experience to work. She understands finance, procurement, marketing, human resources, public affairs, research, strategy, product development, legal, community relations, and more. Coro is key resource when Servus needs advice on embedding sustainability into the business. We have come to expect her practical, tested and comprehensive options for integrating social, environmental and stakeholder considerations into governance, the business model and everyday decisions. Coro is a trusted expert in the CSR field. What Can Coro Do for You? Contact Coro for more information and to discuss your organization’s needs. Here is a checklist tool to benchmark your company’s sustainability governance and management practice. Is your environmental or sustainability plan tactical, operational or ignored by the board and the business? Coro can help you connect your ambitions to your board, your business and your core competencies. Are your functional leaders disengaged? Don’t understand the relevance of sustainability? Coro has the information and experience you need to successfully mobilize business managers. Do you have a sustainability or CSR strategy but struggle with cultural embedment? Coro has conducted leading research into top measures and can quickly and efficiently advise you on gaps and opportunities. These are the key internal and external leverage points to embed sustainability, CSR and ESG (environment, social, governance) into the company business model. Here is a checklist tool to benchmark your company’s sustainability governance and management practices. 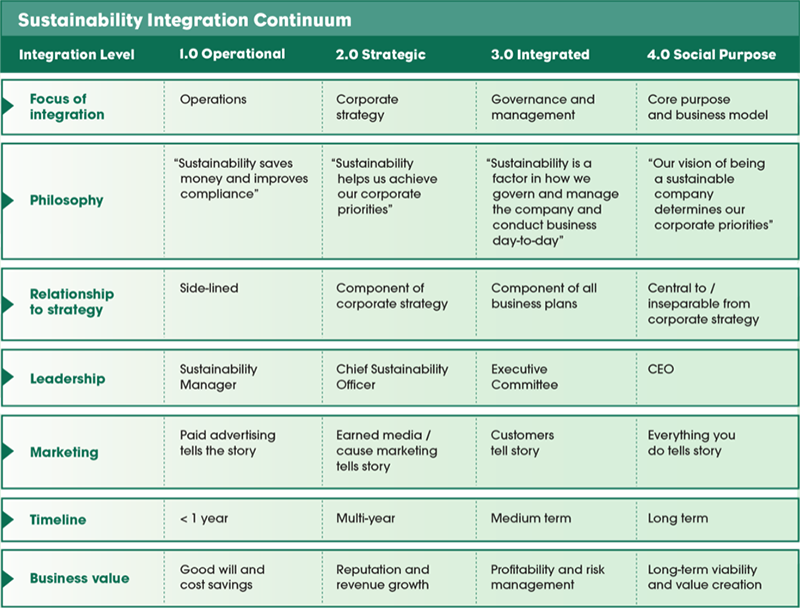 Leading sustainability companies know their sustainability integration strategy is as important as their sustainability targets and metrics. 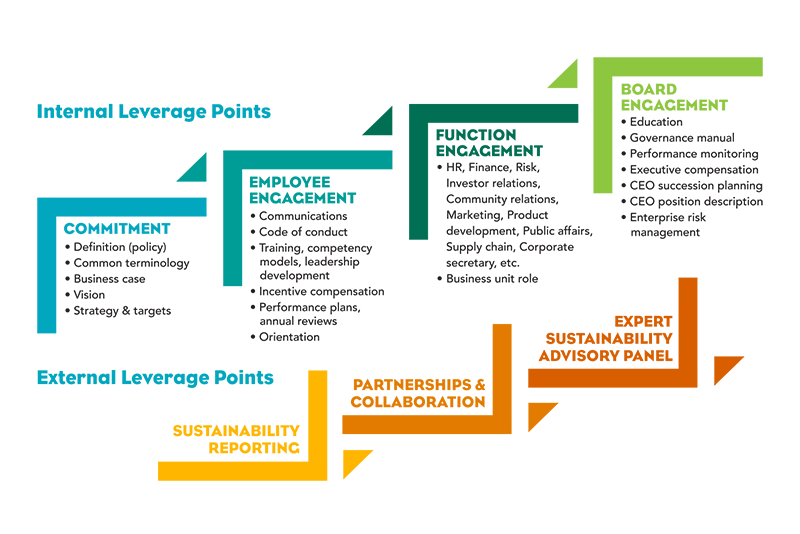 Here is an integration strategy tool to help you and your leaders determine your company’s preference for the level and impact of sustainability embedment. It can help company leaders decide how deeply they would like to embed sustainability into the business model and create a roadmap or workplan to pursue the desired level of integration. How integrated is your company today? Where would you like it to be? What’s your ideal state? What business value do you seek?